« Real beta invite V Fake one. I’m such a shamefull SHADOWpriest. I rarely, if ever, use the lightwell. I do notice it and sometimes even use it but usually it at that more relaxed moments when the fight is under control or at a low attention requirement (say: running for blobs on Yor’sajj, use it as you pass by it). Neon green would probably help. As an extra excuse i’ll say that with graphics set to medium-low and a Sanctuary on the groung I can hardly see it. I’m not that much better with Lock’s stones either, and they’re green! They just sit there on my action bar until that point when the healers are dead and I want to live a few extra secs until Fade comes of CD… 😛 After that I usually ask for another one. More often than not though I’ll go by the whole raid and logout with the same Healthstone on my bags. It is curiously random when people do and don’t choose to use the lightwell… the other night, I had it down on some fight or other, I can’t even remember which one… a fight where it often gets completely ignored. This time, I suddenly notice about 10 people with lightwell renews on them all at once during a medium patch of raid damage. Still don’t know why a bunch of people suddenly got an urge to click it! As melee, who has click to move turned on for other reasons, it is very annoying when you click as the last charge is exhausted, and walk off from your target. Also, of people are on it or a boss ( wing, arm, whatever), moves infront of it, we’ve now clicked that, lost our target, reset our swing trimmer and are no longer auto attacking. I wish you could make a macro to use the lightwell without having to /target lightwell (manually click interaction keybind) /targetlasttarget. I can definitely speak for the folks who just miss the dang thing entirely. As a goblin death knight, when I fight things, I can never see around them. Lightwell? There’s a Lightwell? Where’s the Lightwell? On the bright side, when I die, I get a little break to look for it. My other issue with Lightwells is their very stationary nature. When I play my hunter, I prefer to be as far away from death and potential dismemberment as I can figure out how to be. If the Lightwell is placed within range for the melee, I usually have to make a dash for it. Now if they gave the Lightwell some color, flashing lights and a set of wheels, we’d be in business. Actually I love the lightwell. Espec since in lfr and lfg when things get hairy my hunter normally gets ignored and left to eat damage and die. Theres been a few times where I was the last dps standing due solely to healing potions, healthstones left over from my last bg and bandaging myself for a tic every 60secs. As a class without healing abilties, I’ll take any and all I get offered and tyvm. I like to think I am a “pro-raider”. Did I use it at all Pugnacious one? Doesn’t look like I did, eeek. I had two mana shields though, that’s looking after ones self isn’t it? I’ve tried making it a habit of using lightwells whenever they show up, because hey, extra healing, why not? Got landed in End Time. Got Jaina as the second boss. Jaina’s trash mobs has priests. Those priests drop lightwells. I tried to click one, and was momentarily puzzled when I couldn’t. No-one ever used to touch my lightwell, unless it was to make me rage by using it all up pre-pull. Then I got LightwellBuddy and set it up to send people somewhat smutty pun messages if they use it… My team love it. I rarely have leftover charges when it runs out (gotta save all the kittens), because people click it just to see what random “humorous” 1-in-50 whisper they will get as a response. 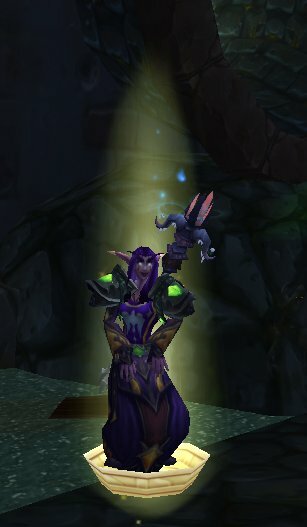 I really wish they would change it so it behaves the same way as the spell does for NPCs (think of the trash before Argent Confessor Paletress in Trial of the Champion or Echo of Jaina in End Time) where it spits out heals as did our Tier 12 proc Cauterizing Flame. I have just specced Holy as my OS (main is Disc) and I did seriously consider NOT taking the Lightwell talent, but did opt to take the risk at it not being a wasted talent choice. When we first start and instance I can seem to get everyone to click. I have the mod your talking about and had to remove the whisper in raids but I do keep the notification when I place it. The same holds true with Warlock Candy. We seem to always get it on our first attempts but as healing becomes less of an issue and people are not falling like rocks it seems to be a mute issue. I know they are adding a Guild Buff for bandages, I know in a raid last week I mentioned bandaging some and everyone was like what bandages. I understand making the LW a smart heal wasn’t on the books but they are changing it for MoP (or at least they were originally). I personally like the LW from the boss in the Argent Tournament.